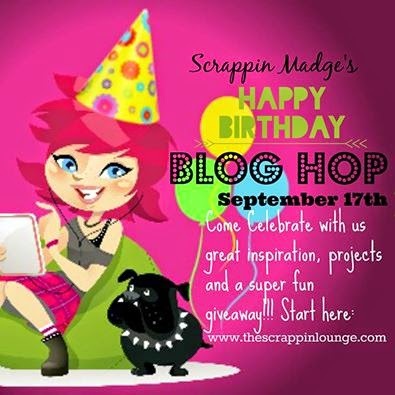 Welcome to Madge's HAPPY BIRTHDAY Blog Hop!! We are so glad that you have come to celebrate with us! We have great inspiration, projects and a super fun giveaway! You will want to start at Madge's awesome blog! If you came from Angela's Wonderful blog then you are in the right spot. What is a hop without blog candy? As you hop along you will find blogs that are giving some awesome blog candy away, just follow their directions on how to win their candy. For my project I made this Gerber Daisy card for Madge. It is one of her favorite flowers! I also know pink is her favorite color! To make this card, I started with a pink base and a lighter pink first layer. I then took my Gerber Daisy embossing folder and I colored it by placing the pink ink right on the embossing folder, then I embossed it on a white piece of cardstock. I then colored the centers of the flowers, added the ribbon and Happy Birthday tag. To finish it and pull it all together I made a Gerber Daisy flower. Now please go and visit Rhonda's wonderful blog and see what awesome project she made! this card is beautiful. she is going to love it. thanks for the tip on color embossing. OMG your card is gorgeous and I love the colors so soft and beautiful. Your card I'm sure is going to really put a smile on the Birthday Girl's face. You did one outstanding creative job. YOU ROCK!! So beautiful and loving the big flower to mimic the flowers on the paper :-) Love it! Gerber daisies are my favorite flower. Love your card. What a beautiful card - I love the colors you chose! I love the idea of inking the embossing folder. Beautiful card! Love this card I too love Gerber daisies. Lovely birthday card! Beautiful flower! Beautiful flower and great card, Sarah! I am excited to be on the DT with you at DTC!!! That is just beautiful,. I have tried that technique before but It never looks like that. great job. Hi Sarah - The daisy is beautiful. I love the pinks. What a beautiful card Sarah!!! I love all the pink and the flowers are gorgeous!! I especially love the daisy...I really want to try to make one of those! Thanks for the inspiration! WOW this is stunning!!! I love the background and I like that you finished with a 3d flower! !